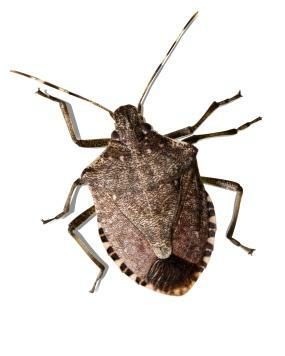 Homeowners often first detect stink bugs by their mass invasions in the fall. They turn up on sunny sides of homes where they warm themselves. Growers often detect them by the damage they cause to their crops. The brown marmorated stink bug (Halyomorpha halys) is native to Asia. It has been an agricultural pest in China, Japan and Korea. It was first collected in the United States in 1998. It is now found in many parts of the country from Maine to Mississippi and from Oregon to Florida. Homeowners can discourage the brown marmorated stink bug from entering the home by sealing as many entryways as possible. Cracks around doors and windows can be sealed with caulk. Vents in attics and crawl spaces can be protected with screen. Any torn or damaged window screens should also be repaired. Weather stripping can help seal gaps under exterior doors. Unfortunately, once stink bugs invade the voids of the home to overwinter, they can be difficult to remove. While overwintering, they do not feed or reproduce. However, they will become active again on a warm winter day or in the spring. When the spring arrives, they disperse from the home and will not return until the next fall. If a homeowner is experiencing overwintering stink bugs, contact pest professionals who can select the most effective materials and determine the best course of actions to prevent a recurrence. In most situations, the best treatment for stink bugs is preventing them from getting inside to their overwintering sites. Your pest management professional will probably recommend sealing all cracks that are more than 1/8 inch wide, screening or repairing existing screens over roof vents, gable vents, windows and doors and installing door sweeps. Chemical products can be applied around possible stink bug entry points. Based on your pest management professional’s inspection, initial application and reapplications of products may be required to treat other stink bugs that fly to the property and attempt to get inside. If stink bugs get inside, vacuuming them can be an effective way to remove them for your home. Also, stink bug traps may be useful. Using chemical products inside is generally not recommended.